New firefighters in training at the Contra Costa County Fire Protection District in California saved a few lives recently - and it wasn't from a fire. These Good Samaritans found two kittens, estimated to be about 10 days old, abandoned in a dumpster that was just about to be emptied. 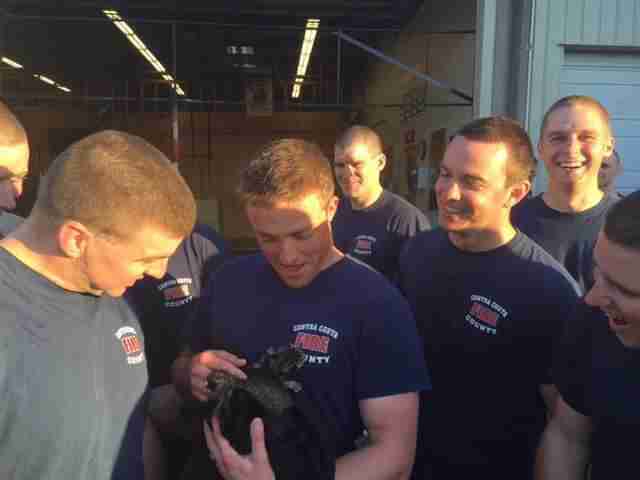 The firefighters, who were in the middle of training, had heard the loud, hungry cries of the kittens and swiftly took action, locating the kittens and rescuing them just before they were thrown out with the garbage. "Thanks to their extra-alert senses and quick thinking, they saved these babies from what would have been a heartbreaking fate," Tony La Russa's Animal Rescue Foundation (ARF) said in a Facebook post. The kittens, who have been given the names Miracle and Milagro ("miracle" in Spanish), are now getting plenty of love from a mom cat named Shannara at ARF who just can't keep away from kittens in need. Shannara, who had just finished weaning her own kittens, was quick to take on the stray pair as her very own. "She heard them crying," Ashley Thiry, a spokeswoman for ARF, told SF Gate. "She was chirping and looking for them really desperately." 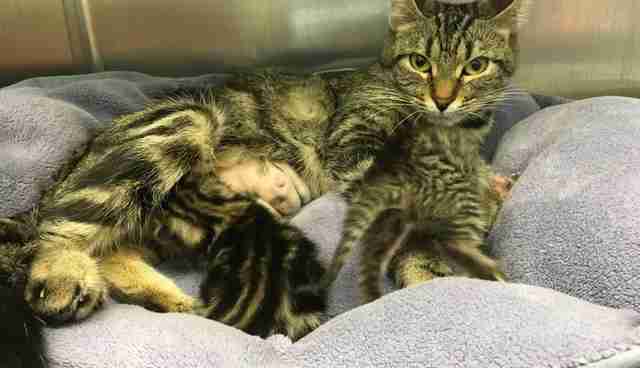 Once the kittens were placed with the mom cat, she immediately allowed them to nurse from her. According to ARF, even though the mother cat has been spayed, as long as the kittens keep nursing from her, she'll continue to produce milk for them. Fortunately, these kittens are getting a happy ending thanks to the firemen who took the time to get them somewhere safe and sound. They're currently in foster care now with Shannara by their side, looking after them. You can keep up with Miracle, Milagro and their surrogate mother on Facebook. Want to help ARF continue to do good work for animals? Consider making a donation here.